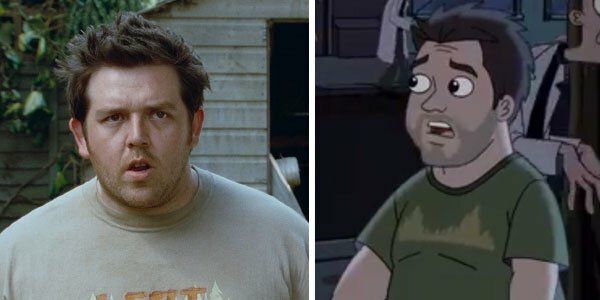 Simon Pegg and Nick Frost have reprised their roles as slacker besties Shaun and Ed of Shaun of the Dead on a most unexpected stage, the cartoon show Phineas and Ferb. The ep airs tomorrow, but The Disney Channel is sharing their cameo today in anticipation. Here’s news, @nickjfrost and myself will be once again stepping into Shaun and Ed’s shoes for the #PhineasAndFerb Halloween special. W00t!! 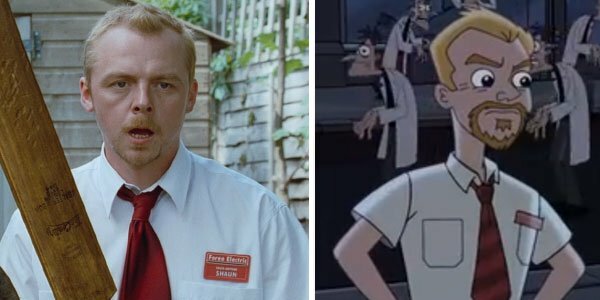 At the time, mention of the Phineas and Ferb ep being a Halloween episode made us suspect that it would be the versions of Shaun and Ed from the end of Edgar Wright's Shaun of the Dead, with one better adjusted and the other a chained-up zombie bud. Instead, we get early Shaun, complete with work uniform, and pre-undead Ed. Those unfamiliar with this wild and allusion-packed cartoon show might be wondering what is going on in this clip from IGN. Well, those "pharmacists" wandering around with their zombie-like contagion are the show's main villain Dr. Heinz Doofenshmirtz. The A-plot of the weekly eps follows the titular brothers Phineas and Ferb on adventures that involve them building incredible contraptions (like the world's greatest tree house or a sentient computer.) But the B-plot always follows their pet platypus Perry, an animal secret agent who is assigned to thwart the would-be evils of mad scientist (not pharmacist, though that's a running joke) Doofenshmirtz. Apparently this time his plan--whether intentional or another insane mistake--involves everyone in the tri-state area (another of the show's running gags) turning into him. Phineas and Ferb is a kid's show, but one that's so full of pop culture nods and clever comedy that it's addictive as an adult. It's likely the clip up top is the extent of Simon Pegg and Nick Frost's involvement in the Halloween episode. (Unless we're given a shot of them turning back when Doofenshmirtz is inevitably bested by a turquoise platypus in a fedora). But as a long-time fan of Phineas and Ferb, I recommend you tuning in anyway. The show's easy to get into, and surprisingly sharp for a kiddie show. The hour-long Phineas and Ferb's Halloween special "Night of the Living Pharmacists" airs at 8PM Saturday, October 4th as part of Disney Channel's "Monstober" event. In the meantime, you can play the tie-in game "The Walking Doof" here.